Click the link for info and to sign up! Community Supported Agriculture creates a partnership between you and the farm that provides benefits to all. CSA members of Wellspring invest in advance, committing to the farm for the season and helping to cover the initial annual costs of the farm season start-up operation (seeds, equipment, supplies, staff & interns, etc). In return, we become YOUR farmer! That's right! Fresh, local and seasonal produce...and it's all organic. Take part and share in the bounty! Our members receive a weekly (or bi-weekly) box packed with wholesome produce, straight from the farm. Our Summer Shares run from mid-June to mid-October. Our Fall Shares run from mid-October to the week of Thanksgiving. You will also receive a weekly e-newsletter which includes farm news, information on items in the boxes, produce identification photos, storage and cooking tips, recipes, and more! By signing up with Wellspring you are also playing your role in training the future generation of sustainable and organic farmers. We are training the next generation of organic farmers, securing future food access and building community resilience! You get to know your farmers! We invite partners to stop by and see where and how their food is being grown. This is a great way to connect to your food and farmer. It also gives you a chance to see what real food looks like while growing! Your partnership helps support Wellspring's diverse adult and youth education offerings. 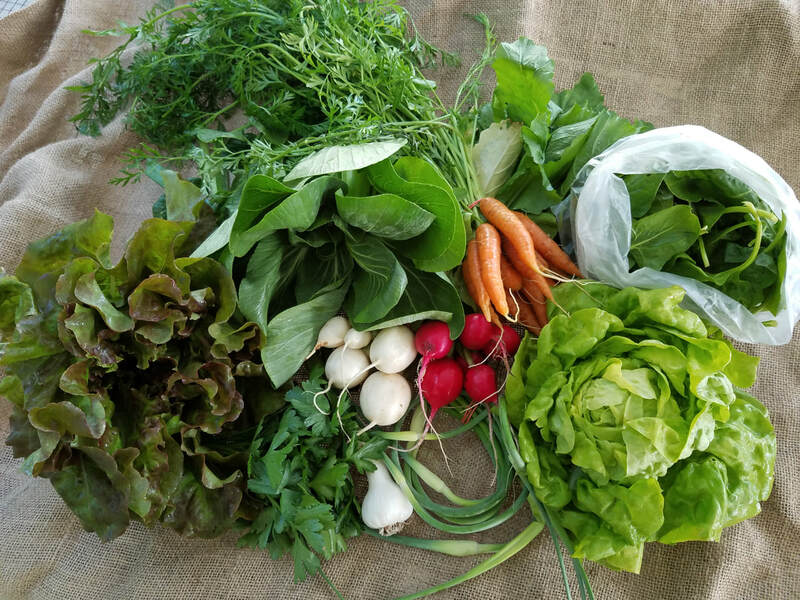 Joining our CSA supports your local economy! Instead of purchasing vegetables from the large corporations of the Big Ag Industry, you are putting your dollars into your local economy and local pockets. 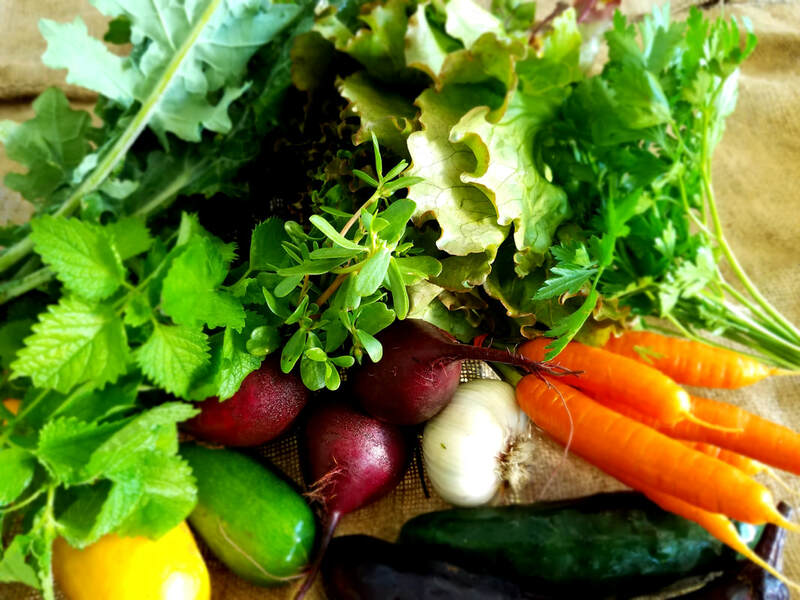 Partaking in a CSA allows you to eat fresh, just-harvested produce straight from the farm. Never eat tasteless veggies again! Organic CSA farms do not pollute our groundwater with harmful pesticides and herbicides. This helps protect the quality of drinking water for future generations. The FUN that comes with trying new things! CSA farms include some heirloom and unique vegetable varieties in addition to the classic favorites. Joining a CSA lessens CO2 emissions caused by the energy used to transport and refrigerate produce across long distances. The SAVINGS! CSAs provide produce at a lower cost than what you can find in the grocery store because we cut out the middleman. CSA is convenient and we offer multiple pick up locations so you don't have to travel far for fresh veggies. Signing up for a CSA share insprires you to eat healthy food because CSA boxes are packed with nutritious goodness!